With its convenient location, directions to the Roanoke Valley in Virginia&apos;s Blue Ridge are quite simple. Considering the majestic beauty and unspoiled vistas, you might think Virginia&apos;s Blue Ridge Mountains are a remote, far-away destination. In reality, the Roanoke Valley is located at the southern end of the Shenandoah Valley in Western Virginia and easy to reach by road, rail, or air. Because it has always been an important crossroads to travel and commerce, Virginia&apos;s Blue Ridge is easily accessible by several major highways, as well as the Blue Ridge Parkway. The Roanoke Valley is less than 300 miles from the coast of Virginia and approximately 250 miles southwest of Washington, D.C. 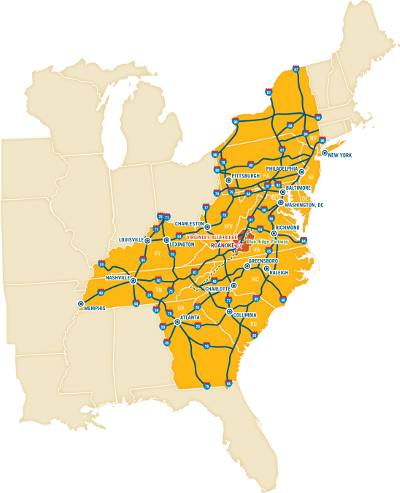 The region is around 50 miles north of the state border with North Carolina and 105 miles from the Greensboro area. If traveling on Interstate 81, the southwestern portion of Virginia&apos;s Blue Ridge (Blacksburg/Christiansburg area) is 120 miles from the state border with Tennessee. The Visitor Information Center (101 Shenandoah Avenue NE, Roanoke, VA 24016) is open from 9:00am - 5:00pm, seven days a week. Follow US 220 North as it becomes Interstate 581 in the City of Roanoke. Take Exit 4 East off Interstate 581/Route 220 North to Orange Avenue (also Route 460 East). At the light take a right on Williamson Road (Berglund Center is on your right). Proceed to the fourth stop light at Shenandoah Avenue and take a right. The Hotel Roanoke & Conference Center will be directly on your right. The Visitor Information Center is the building on the left. It&apos;s located in the former Norfolk & Western Railway Passenger Station. Take Exit 143 off Interstate 81 onto Interstate 581 South toward Downtown Roanoke. Take Exit 5 to Wells Avenue. The exit ramp will split - proceed left and merge onto Williamson Road. Take Williamson Road and turn right at the second light, which is Shenandoah Avenue. 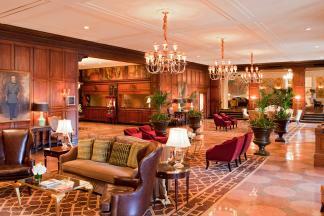 The Hotel Roanoke & Conference Center will be directly on your right. Exit the Parkway at Milepost 120 and follow directional signs toward Mill Mountain on J.P. Fishburn Parkway. Take J.P. Fishburn Parkway down Mill Mountain for 1.5 miles as this road becomes Walnut Avenue. Continue on Walnut Avenue SE for 1/2 mile and then turn right on Jefferson Street, which is just after the bridge over the Roanoke River. Take S. Jefferson Street for 1/2 mile and turn right on Franklin Road. Go one block on Franklin Road SE and then turn left at first light on Williamson Road SE. Take Williamson Road SE for .4 miles and make a u-turn at the intersection of Williamson & Wells Avenue. Take Williamson Road NE and turn right at the first light on Shenandoah Avenue. The Hotel Roanoke & Conference Center will be directly on your right. For more information about navigating and directions to various points of interest in the area, please view our Maps section. Check out our great places to stay!